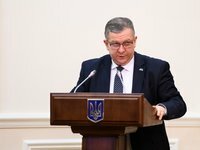 Ukraine's Minister of Social Policy Andriy Reva has stated that increased pensions will be taken into account when assigning housing subsidies only from May 2018. "The new size of pensions will be taken into account when granting subsidies only in May 2018," he said during an hour of questions to the government in parliament. Reva noted higher pensions will not be considered when assigning subsidies for the heating season.